Owen Waters is an international spiritual teacher who has presented his insights into the New Reality to hundreds of thousands of seekers. In 1963, while growing up in a mystical part of Britain, he encountered his first spiritual awakening. The surprise of this mystical experience was such that his life became focused upon a continuous search for spiritual answers. Almost forty years of study and research followed, along with the development of his inner vision. By the year 2002, like many of the spiritual teachers who are coming forward for The Shift, his realizations began to unfold rapidly. Today, as Editor and co-founder of Infinite Being LLC, he helps people find inspiration, love and creativity through heart-powered consciousness. The Shift is the spiritual and creative awakening of humanity. This transformative movement has gained momentum in recent years to the point where, today, more than one in four adults have moved forward towards this new stage of cultural awareness. New Reality consciousness means to experience new vistas of awareness and new levels of creativity. It means following your heart to express your inner joy through making your own meaningful contribution towards the betterment of the world. Millions of pioneering trail-blazers have already made it through The Shift and into the new awareness. Every day, more people follow their example and discover a deeper, more meaningful quality to life. 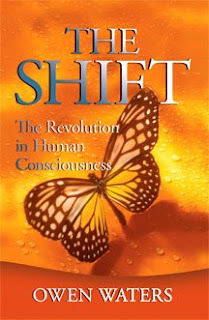 In "The Shift: The Revolution in Human Consciousness," Owen Waters has woven together leading-edge cultural studies with his own discoveries about the human energy system in order to demonstrate that we are in the midst of the biggest cultural shift of all times. This book demonstrates that the future of mankind is not just bright… it is brilliant! The New Reality brings with it a new vista of awareness. In order to operate successfully in the new environment, you need to apply the new principles which come with that expanded vision, that greater vista of reality. Such knowledge empowers you to awaken to your newly expanded potential and to manifest that potential with ease. When I was sixteen, my physics teacher said, “Basic principles, lad. When you know the basic principles, you can solve any problem.” I have often thought how right he was. Here, we will examine some basic principles of the universe, as seen from the viewpoint, or the expanded vista, of the New Reality consciousness. In this, the ultimate reality is recognized as universal consciousness, as the formative essence behind all that exists within the universe. I call that essence Infinite Being because it is the awareness behind everything within the universe. Infinite, as in All That Is. Being, as in fundamental awareness. Infinite Being is the deepest concept of God or The Absolute.